Why should a plant manager care about the trendy new food he saw on a cable show last night? Because it could end up in the R&D lab tomorrow and in his own plant's machinery shortly thereafter. While some trendy dishes are flashes in the pan, the ones that aren't can end up affecting factors from machinery design and selection to plant productivity and throughput. How might your plant be affected by the demand for hand-held sandwiches? What if instead of bread, biscuits or bagels, marketing says you need to make pancakes or waffles? If the traditional oil in the formula is replaced by a trans fat-free one, what will that do to your machines? Likewise, changes in how you make potatoes, mini muffins, cereals or anything can mean an upgrade to your equipment and processes. The flexibility to adapt to ever-changing trends is a key competitive attribute of your plant if it's to keep track with consumer demand and the flood of new products you may be asked to retool for tomorrow. "Fast feeders" are driving breakfast trends, owing to that product category's treatment as a day-part, not exclusively an early-morning meal. Major chains not only put lots of effort in coming up with compelling new products; they also put the marketing muscle behind new launches, adding a significant chunk of business for the processors chosen to produce them. Tapping trends is seldom revolutionary. Some of the biggest growth areas for breakfast foods this year "aren't all that new," says Bob Goldin, executive vice president at consulting firm Technomic (www.technomic.com), Chicago, because many have been on the horizon for at least a few years. "About 80 percent of our business is with the food manufacturers or processors. And most of what they develop, especially for breakfast, is largely driven by the restaurant chains," says Goldin. And what do the big chains want? "Those chains are continuing to look for products that fit consumer needs for portability, for value, for good taste and health. That's what consumers seem to be looking for in the breakfast day-part." While retail grocery and frozen sales are relatively flat, foodservice is where the action is, he says. "There have been innovations with breakfast fast sandwiches in the retail chains, but they're not setting the world on fire," Goldin says. 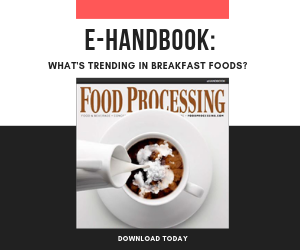 So processors continue to pursue high-volume, national foodservice account opportunities for muffins, bakery items, proteins and breakfast items across the board. As breakfast outperforms the overall food industry, fast feeders drive new breakfast sandwiches, yogurt parfaits, meal-replacing smoothies and oatmeal. Most of these product concepts started in McDonald's and Starbucks. So where do they get their ideas from? Top chefs at a world-renowned eateries such as French Laundry or Alinea or Noma. If one creates a hit using lingonberries, "for all we know, we could see lingonberries on the breakfast menu at McDonald's next year," says Leith Steele, senior account manager for Andrew Freeman & Co. (www.afandco.com), San Francisco. And then? An explosion of lingonberries first in gourmet stores and then larger grocery chains over the next year or two. Steele's firm predicted potatoes would be huge trend for 2011 and 2012, expanding product ideas to let dining customers get customized cuts, mix-ins, dips or toppings. Likewise for hash-slingers, for whom "My Roasted Potatoes" could be the next big thing for custom mix-ins of sausage and more. She also says that "breakfast any time of day" will grow, as will sandwiches using biscuits or even savory sandwiches using waffles, french toast or bread pudding with ham or other breakfast meats. Somewhere in between the fast food giants and the grocery stores is a lucrative niche especially for some former commissary operations. Lord knows, they're not making airline food anymore, but the same operations are assembling products, for all day parts, at convenience stores. C-store work has picked up so much that "many are looking at automating and making mechanical operations out of what was done by hand," says Bob Grote, pres./CEO of Grote Co. (www.grotecompany.com), a Columbus, Ohio, maker of slicer/applicator and sandwich automation equipment. "Customers have asked for conveyors to assemble sandwiches – they have to be flexible enough to handle different sandwiches and have a clean-in-place belt – maybe depositors to add cream cheese or condiments or sauces," he continues. "A little automation can save incredible time and manpower on lines that used to have a dozen or 15 people assembling different parts of a meal." At the end of last year, Grote debuted a horizontal bread cutter, a dual-lane, stainless steel unit designed to horizontally cut virtually all types of fresh sandwich breads and rolls, including croissants, breakfast biscuits, bagels, submarine buns and Panini. The cutter easily transfers the breads or rolls to a sandwich conveyor to continue the assembly process in automated or semi-automated fashion. At the end of the line, packaging is moving toward automated "butcher paper-style" wrapping, not foodservice film or shrink-wrap, "because paper wrapping looks like it was applied in the convenience store by hand, rather than at some factory," Grote says. And it's not just the C-stores. Higher-end grocery stores that are doing a good fresh breakfast or sandwich business also are looking at automating their in-store processes, he adds. For every new size and shape of food, there's a machine. Robert Reiser (www.reiser.com), Canton, Mass., has seen an "an uptick in machines used to portion and form potato products," says John McIsaac, vice president of strategic business development. And if more people eating more breakfasts drive sales of more machines, that's great too. But while some new formulations won't require much change to machinery, some can -- such as the trend to cut the fat, which has made it more difficult to portion and form in many situations, says McIsaac. In response, Reiser has had to develop new pumping and cutting methods because plants "are using substitutes for fat that make their products stiffer and more difficult to portion. They also like to use more inclusions, and they want them to show after portioning." All this breakfast automation does not come without an eye on quality. "We're seeing increasing demand for sorting equipment to meet rising product quality and food safety standards," says Steve Johnson, director of marketing at Key Technology (www.key.net), Walla Walla, Wash. He cites nuts, fruits, berries and some grains sold as ingredients for cereals, yogurt and smoothies. Stemilt Growers of Wenatchee, Wash., installed a Key Optyx sorter in 2011 to sort dark red cherries and automatically remove foreign materials and defects, including soft fruit. Operating the installation 20 hours a day, seven days a week during the past year's packing season, Jay Fulbright, vice president of operations at Stemilt, said he uses the system to "sort out major grade defects before hand sorting. It's allowed us to increase our throughput without increasing labor." To deliver the cherries to the sorter, Key designed a special infeed with a water spreader and dewatering belt. Image processing included cameras above the product on the belt as well as below the airborne cherries as they launch off the end of it. Image processing, which was customized for cherries, activates an air-jet ejection system as needed. The system sorts three to four tons of cherries per hour using a 24-in. belt; that can be doubled with a 48-in. system. "In general, we are seeing cereal manufacturers looking to upgrade equipment on their production lines," says Johnson, suggesting that this may be part of consumers' eat-at-home efforts in a still-tight economy. This, along with the healthy-eating trend, relates to additional interest in grains. "More whole foods of a specialty nature are being processed today worldwide than, let's say, 10-20 years ago," as healthier eating has trended upward, says Karl Seidel, marketing manager for Cablevey Conveyors (www.cablevey.com), Oskaloosa, Iowa. Through the recent tough economy, he's seen more of his customers offering more "valuable nutrient-rich whole foods" such as specialty grains. "We are seeing more alternatives to wheat, such as millet, sesame, quinoa and barley used today," he continues. "Also, health bars that include more healthful ingredients like nuts, dried fruits and alternatives to sugar and HFCS, such as stevia." Delicate or expensive grain-based cereals and agglomerations such as granola clusters sometimes require the gentle handling of Cablevey's tubular drag conveyors, which use a cable-and-disc assembly to gently convey materials in flights through closed piping. "We see lots of need for versatility in the production of breakfast foods," says Reiser's McIsaac. His example du jour: Reiser's Vemag doublescrew portioning systems for handling a wide variety of items. Those products include "breakfast burritos with multiple flavors and large particulates, IQF eggs that must be portioned and formed while maintaining identity, and breakfast sandwiches that require a Vemag and the addition of a cheese slice depositor to top the sandwich." The Hinds-Bock 18P-03 is a heavy duty industrial batter depositing machine useful for large scale production of products such as pancakes, waffles, cupcakes, cake batter, muffins or flowable cookie batters. Learn more in our Products Department. Also "bite-sized products are very convenient and popular [so] more companies are producing smaller portion products," says Lance Aasness, vice president of sales and marketing with Hinds-Bock (www.hinds-bock.com), Bothell, Wash. The company's high-speed depositors can pump-out batter for as many as 1,000 mini muffins, snack cakes or brownies per minute. The multi-piston depositors, controlled by servos and mated to horizontal vacuum formers, expand application possibilities with the flexibility to handle eggs used for hand-held sandwiches as well as sauces and mashed potatoes. "The challenges with running mini products are yield and efficiency, when compared to running traditional-sized products," says Aasness. "To achieve similar yield and efficiency, the mini products lines need to run faster and the depositors need to make more deposits with each cycle." Equipment has to match the depositing of product into pans that can have as many as 24 cavities across. The extra wide footprint and the need for high speed, he says, "mandate that the depositor be robust and have spouts that are designed to cleanly shut off the batter without tailing." In general, no matter where food trends take a plant, the application versatility of today's machinery is enhanced by easy access to components eases maintenance and sanitizing operations for more rapid changeover and, accordingly, greater productivity and payback. Substitute new ingredients to make 'the most important meal' even healthier. Hinds-Bock's 18P-03 is a heavy duty industrial batter depositing machine.